“Monster Hunt” (捉妖记), the solo directorial debut by Hong Kong-born, erstwhile DreamWorks Animation staffer Raman Hui – he worked on the “Shrek” franchise, the third of which he co-directed – is currently the highest grossing film in Chinese box-office history. And as far as hybrid CG animation/live-action blockbusters go, it’s certainly one of the weirdest. It’s essentially a kids’ movie, but gets into some rather dark and disturbing areas. The fact that this so smoothly gels with the martial arts and song-and-dance elements – the film breaks for musical numbers, like a Bollywood movie (Chollywood? ), at the oddest moments – makes this all the more bizarre an experience. But never let it be said that Hui leaves any stone unturned in his quest to entertain. And, much like the late ‘60s TV show “H.R. Pufnstuf,” one can imagine that this film would lend itself well to being viewed with, shall we say, herbal or chemical enhancement. “Monster Hunt” is set in a mythical ancient China, and the opener reads as a faintly parodic version of the way a typical Chinese historical film would begin, with a voiceover explaining to us the period details we need to know to situate ourselves and comprehend the plot that is to follow. However, instead of warring ancient territories, here we get a tale of the war between humans and monsters, who used to co-exist but have become embroiled in conflict with each other, resulting in humans gaining dominance and monsters being banished to faraway mountainous lands. A civil war has broken out among the monsters, causing the pregnant monster queen to flee into the human realm, carrying in her womb the future monster king. The queen is accompanied by two retainers, Zhugao and his wife Fat Ying, who – as many monsters in the human realm do – disguise themselves as humans (played here by Eric Tsang and Sandra Ng, in spirited comic performances). They eventually come to Yongning Village, where they’re met by the village mayor Tianyin (Jing Boran), who welcomes them into his home for a meal. However, it turns out that Tianyin’s the one on the menu, as the three monsters conspire to catch and eat him. Their plan is interrupted by the arrival of Xiaolan (Bai Baihe), a low-level monster bounty hunter who attempts to subdue the monsters with a mix of sorcery and martial-arts, to capture them, get a big reward, and increase her monster-hunter ranking. Her efforts are complicated by Luo Gang (Jiang Wu), a rival bounty hunter who arrives on the scene to claim a payday. Right in the midst of all this action, the monster queen, who happens to be dying, takes drastic action to save her progeny. She plants her fetus into Tianyin – via a unique method I’ll leave for viewers to discover for themselves – right before she dies. Much comedy is spun from the Tianyin’s predicament, essentially that of a pregnant man. Soon afterward, Tianyin “gives birth” – again, I won’t spoil the details of how – and out comes an unsurprisingly strange-looking, yet weirdly adorable creature who appears to be a cross between the star child from “2001: A Space Odyssey” and a radish. 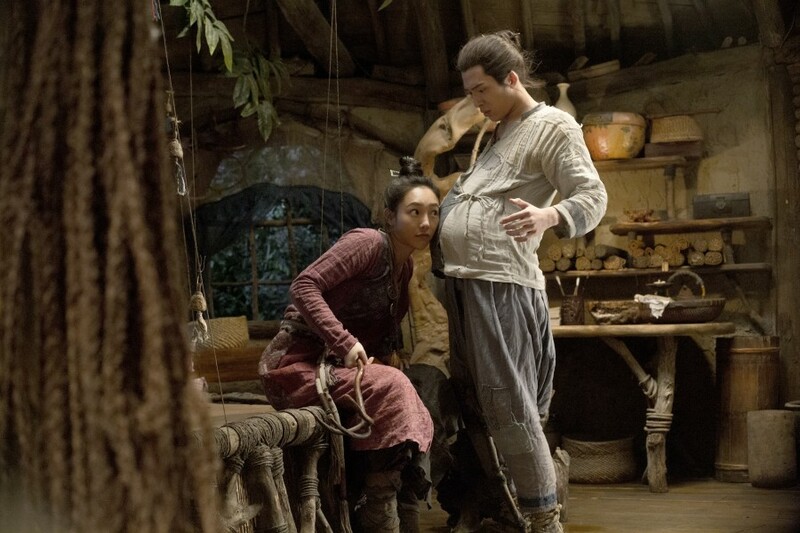 Based on his human baby-like babble, Tianyin names the child “Wuba.” Tianyin becomes emotionally attached to Wuba, while Xiaolan recognizes the great monetary value that can come from selling the creature for a bounty. Despite herself, however, Xiaolan starts to take a shine to Wuba as well, and begins to waver in her convictions to profit from the little monster tyke. There’s much more plot and incident stemming from this situation, which plays out in the film with lots of exuberant comedy and energetic martial arts, as well as some more emotionally poignant passages. There are some very disturbing scenes late in the film that will definitely be scary for very young kids, and probably some adults as well. The most bizarre of these concern a fancy restaurant frequented by royalty that serves captured monsters as food for humans, as a sort of culinary delicacy equivalent to something like shark fin soup. The scenes in the restaurant kitchen are as darkly humorous as they are queasiness-inducing, with little children in cages – apparently monsters in disguise – waiting to be carved up, sautéed, steamed, and chopped into sashimi, depending on customer orders. The dark humor here separates “Monster Hunt” most sharply from typical Hollywood fare, even as much the film often resembles its American counterparts in visuals and certain plot elements. While there are several instances of gaps in logic and narrative lacunae that may make its story confusing for some viewers, “Monster Hunt” remains an enjoyable watch, its infectious fun enhanced by the VFX which are far superior to what is typically the case in Chinese films. The monster designs, especially, are impressive on a technical level, always imaginatively varied and interesting; the transitions back and forth between the monsters and their human disguises are smoothly handled. There are also some lively performances from Ng, Tsang, and Wallace Chung (“Drug War”) as the chief monster hunter (and monster restaurant owner) rabidly devoted to his goal of eradicating all monsters in sight. As far as the leads go, Jing is an appealing presence, if somewhat on the bland side. (Jing was a late replacement for the original actor, Taiwanese star Kai Ko, who was dropped from the film as a result of his drug bust – along with Jackie Chan’s progeny Jaycee Chan – and subsequent ban from the industry; the re-shoots this casting necessitated reportedly doubled the film’s budget.) However, Bai’s charismatic turn as the plucky bounty hunter is terrific, and really gets the film going, as well as helping to spur Jing to step up his own acting game. Together, they eventually prove to be a very engaging onscreen pairing. “Monster Hunt,” more than probably any other Chinese film in recent memory, makes a strong case for the formidable commercial strength of the industry and its ability to create product that can hold its own with anything coming from the West. Instead of mere imitation of Hollywood models, “Monster Hunt” proves that local Chinese films can retain their unique cultural characteristics while engaging with Hollywood-derived narrative and visual modes. Whether such a concoction has appeal or translates in the opposite direction, from East to West, is anyone’s guess, however. “Monster Hunt” is now playing in U.S. and Canadian theaters in 2D and 3D, in both the original Mandarin-language version with English subtitles, and a shorter English-dubbed version. For locations and tickets, visit the distributor FilmRise’s website.